Thirteen amazing stories of survival and triumph are woven together in this inspiring book. Up From Rock Bottom will encourage you and help you find your purpose through adversity. When faced with obstacles and seemingly no real end in sight, many people desperately search for answers. We often ponder our reason for existing and question why fate and even God has allowed our circumstances to occur and fester. We wonder if we are alone in our plight and how other individuals manage to overcome similar situations. 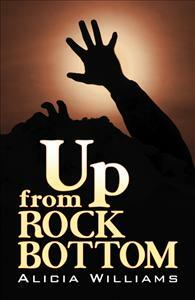 Up From Rock Bottom addresses these gut-wrenching questions by showing the amazing will and determination of the human spirit as well as the unwavering strength and faith of God. You will not only be encouraged, but will also find your purpose through adversity. I just finished reading and this book is awesome! Absolutely amazing. Everyone in the WORLD should read this books. The stories will encourage and uplift all. Alicia does a fantastic job in the telling these stories. Surely everyone will take some thing from this novel. Many will find that they don't have any problems after reading the stories in this book. This book is easy to read. It captivates you and makes you determined to learn of all the people. Your eyes will swell with tears and you will cry. Your heart and spirit will be strengthened and all doubts about God will be wiped away. I can't wait for the next.